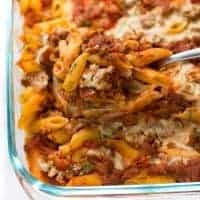 Dairy-Free Baked Ziti! This recipe will AMAZE you. The cashew cream sauce sets up just like ricotta – but totally dairy-free! Place the raw cashews in a bowl. Cover with boiling water (the 1 cup of water will be used later, just use enough boiling water to cover the cashews) and let sit for 30 minutes. You can make the pasta and tomato-meat sauce in the meantime. Preheat the oven to 350F. Cook the pasta according to package instructions – but subtract a minute or so from the boil time so the pasta is al dente. In a large skillet, add 1 tablespoon olive oil along with the Italian sausage and onion. Cook, breaking up into small pieces until browned and cooked through, about 6-8 minutes. Add the garlic, Italian seasoning, red pepper flakes, marinara sauce and diced tomatoes. Cook until heated through for another 5 minutes or so. Remove from heat and set aside. Add a scoop of the tomato-meat sauce to the bottom of a 9×13 pan. Spread out evenly. Mix the pasta with 1/3 of the remaining tomato-meat sauce. Pour half of the pasta into the pan. Drizzle over half of the cashew sauce followed by another 1/3 of the sauce mixture. Add the remaining pasta followed by the rest of the cashew sauce and tomato-meat sauce. Bake for 25-30 minutes until golden and bubbly. Let sit for 10 minutes before serving. Enjoy!